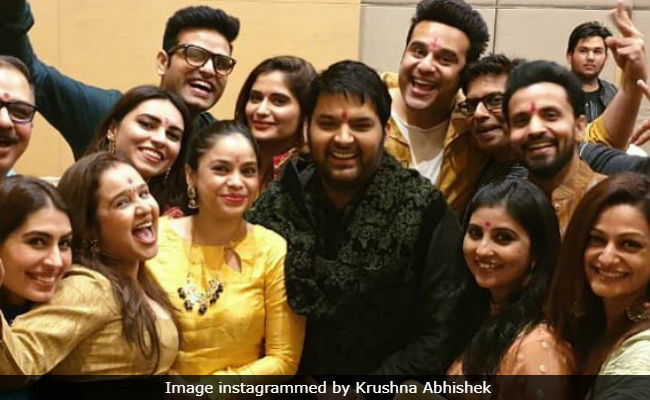 Kapil Sharma's pre-wedding festivities are in full swing. The wedding festivities started with a jagran at Kapil's home in Amritsar, which was attended by his friends and colleagues such as Krushna Abhishek and Sumona Chakravarti among others. "All night fun on Kapil ki shaadi in Amritsar. Tonight sab jaag rahe hain as jagran. Jai Mata Di," Krushna captioned a picture of the gang at the venue. On December 12, Kapil Sharma will marry longtime girlfriend Ginni Chatrath in Jalandhar, Ginni's hometown, and the baarat will travel from Kapil's home in Amrtisar. The wedding festivities at Ginni's home began last week with an akhand paath, the pictures of which went viral. Kapil Sharma was filming episodes for his upcoming season of his show The Kapil Sharma Show up until the last moment. After marrying in Jalandhar, Kapil's family will host a reception in Amritsar for the newlyweds while the actor comedian will host a separate reception in Mumbai on December 24) for his colleagues and members of the film fraternity. Speaking about the wedding festivities, Kapil earlier told news agency IANS: "We wanted to keep it low key. But Ginni is the only daughter in her family. Her folks wanted the wedding to be on a lavish scale. And I completely understand their sentiments. My mother also wants the wedding to be lavish." Meanwhile, the date for Kapil Sharma's return to the television has been set for December 23, a day before his Mumbai reception. Apart from Sumona and Krushna Abhishek, actors Kiku Sharda and Chandan Prabhakar will also entertain the audience with Kapil Sharma in the new season of The Kapil Sharma Show.